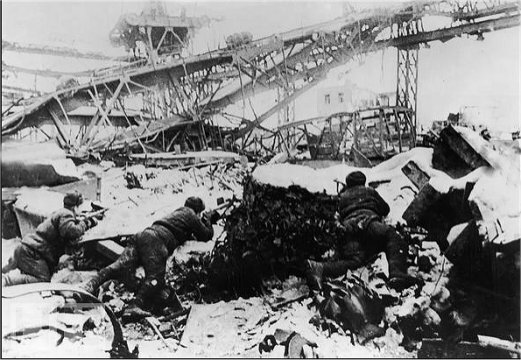 Red Army engineers at Stalingrad. had to solve a number of missions involving a great deal of responsibility. 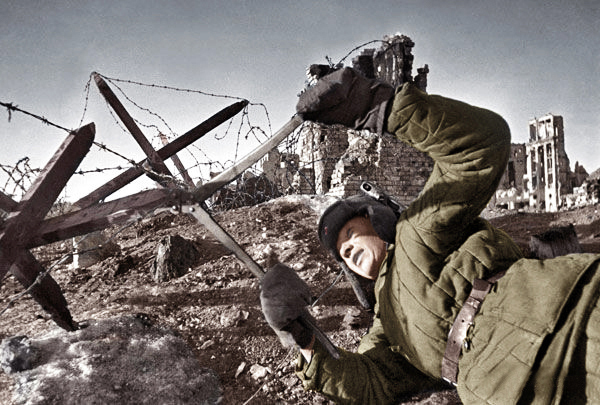 necessary materials and technical equipment to be used in the offensive operations. bank of the lower Volga. 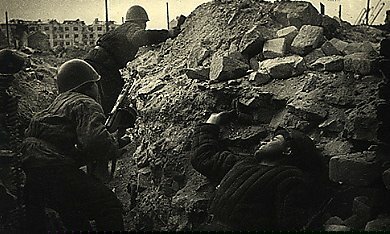 the enemy in the period of the attack. the Volga and make possible an uninterrupted flow of supplies for the field forces. the beginning of the operation. number of measures for assuring normal conditions of operation. propelled vessels with a load capacity of 5,100 tons. crews, supply rigging, tackle, and spare screw propellers and organize repair shops. a function of the military units maintaining the crossings. discovered four half-submerged barges with supplies of fuel amounting to 6,000 tons. The vessels were assigned to these improvised "bases" for supplies. because some of them failed to accomplish the trip against the current in order to get the fuel. ice floes. In view of this, it was necessary to plan to transport the fuel by tank trucks. We organized several of such columns, but even these could not supply all the fuel needed. reconnoitering their rear lines and system of defenses. where the enemy was most likely to strike. the construction of five bridges and 12 grade crossings over railway lines. wells in the towns and villages captured from the enemy. preparatory period of the Front operations and in the period of their execution. accordance with the missions of the troops. crossing, three engineer battalions, and for defensive work, 14 engineer battalions. Engineers did not arrive until after the crossing had been made. platforms, rafts, fishing boats, and pleasure boats to be found in the area of the crossing. Extensive use had to made of all these means for the arrangement of ferry crossings. 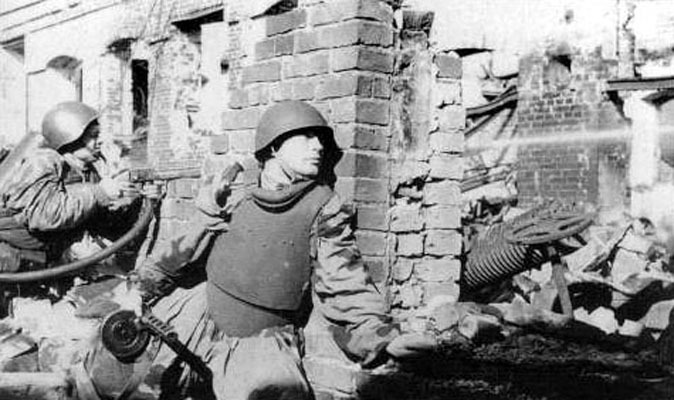 due to being blown up by their own mines in the demining of a jump-off line for ihe attack. by artillery, mortars, and small arms. and to bombing from the air, and at night he kept them under artillery and mortar fire. obstructed the movement of vessels from Akhtuba and the base was transferred to Tumak. breaker tug of the type "Dzerzhinskii" from reaching the Svetlyi lar crossing. to November 13 was 196 to 220 centimeters. On November 6-7 in the area of the Front, we had a rainy spell accompanied by winds. 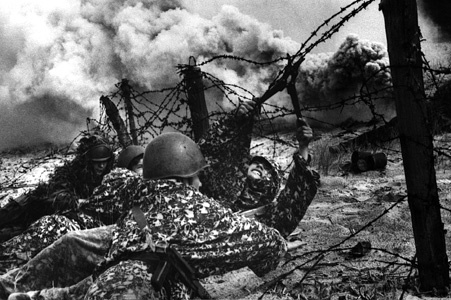 the crossings of the 64th Army, by taking from them the steamer "Mikhail Vlasov." places, at times with the help of engineers who arranged passageways by blasting the ice. hand and, farther away from the vessels, by means of explosive charges or hand grenades. additional work in repairing them. launches proved to be very effective under these conditions. from it. 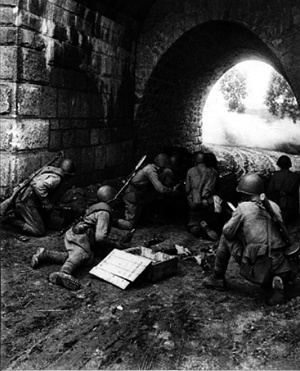 Under the aimed fire of the enemy we crossed reinforcements, ammunition, and food. 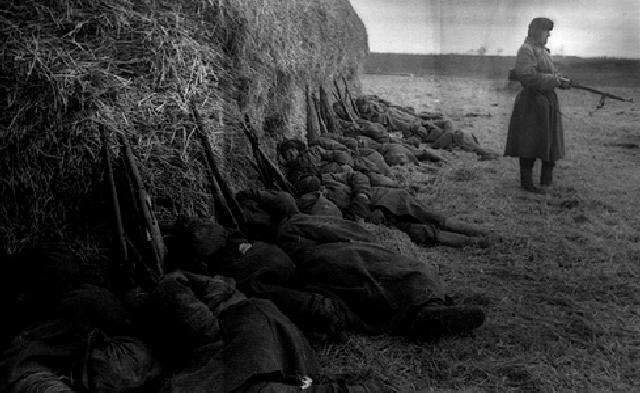 night of November 28-29, 360 wounded soldiers were crossed to the left side in boats. of observation points on these sectors was increased two- or threefold. The greater part of the observation points were located on the forward edge of our defenses. Each of them consisted of a heated blindage-dugout and a rifle pit with a cover for observation. educated private, whose duty it was to direct the group and keep a record of the observations. the defense systems on this sector. after the capture of the area, we found four additional fields not noticed by the scouts. second echelon of the enemy. 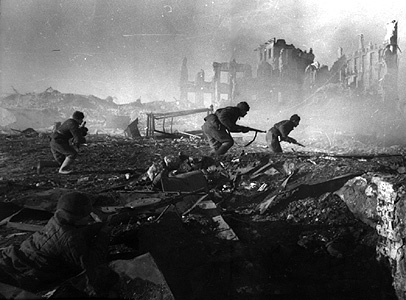 success of the breakthrough of the enemy defenses. certain cases, the interrogation of the prisoners. brigades, five motorized rifle and mechanized brigades, and six cavalry regiments. a reliable cover for the zone between the railroad and the Volga. more than 1,500 bottles with "KS" liquid fuel. was possible only during the time of artillery and mortar fire. had a good knowledge of the location of the minefields and the passageways through them. the offensive, to provide the troops the necessary safety measures. Some of the units were at a distance of 20 to 25 kilometers from sources of water. necessary to transport water in barrels and drums carried by horses or camels. these to the attacking units. A total of 45 engineer companies were selected. in a concrete manner the missions of the engineer groups as to time and lines. 37 of the most convenient routes for bypassing the minefields. 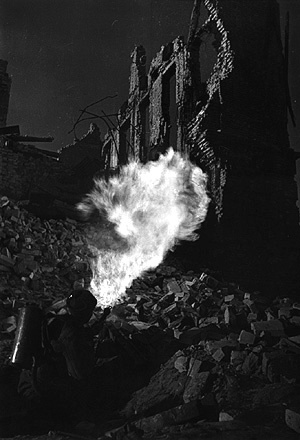 detectors were used only to a limited extent because of the absence of BAS-60 batteries. and oftentimes under heavy fire. by regimental and divisional engineers. by external signs, the engineers detected by visual examination the minefields of the enemy. 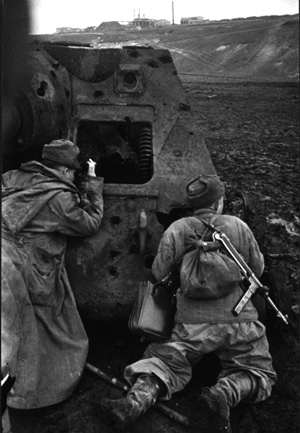 of the enemy, the engineers, in the course of the advance, became separated from the tanks. of mines on the approaches to inhabited localities and near bridges. month, the shoals on the Volga began to affect navigation. had a length of 1,600 meters, started operations beginning on the morning of November 30.
of the landing places was 350 meters. of rudders and the welding of boilers. men and freight on N2P pontoons). of Tatianka lo make 12 lo 19 trips during the daytime. not as large as a result of theformation of obstructions upstream. the freezing, we started the construction of sledrope paths for loads up to 100 kilograms. purpose in the amount of 6,000 cubic meters. was held up for several days. replacement, of the screw caused long interruptions in the work. routes of march to the crossing. independent decisions in questions pertaining to crossings. of the engineer troops and the chief of staff of the Front also went to these places repeatedly. reequipping the moorings and even in changing, at times, the line of the crossings. preparation for the operation was on the basis of partial instructions from the staffs. 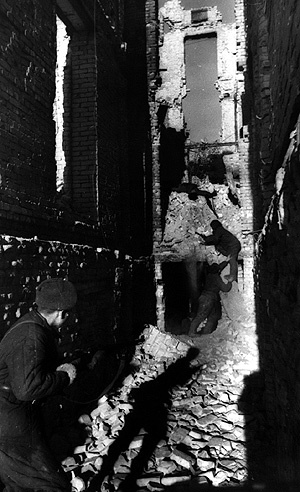 operations, and the rest of the battalions occupied themselves with subordinate works. Volga. All these deficiencies had to be corrected quickly in the course of the operations. were far away, were maintained exclusively by foot messenger communications. of the engineer personnel or equipment. and, at the same time, showed the absolute necessity of improving their training and cohesion. troops have their own radio signal communications. of the small engineer units on the battlefield itself and were always informed of the situation. had to be assigned to the assistant of the chief of staff of the engineer troops of the army. both their own engineer equipment and that assigned to them. out fully and on time. Front enables us to draw a number of practical conclusions. employed in a concentrated manner and not piecemeal. proper organization and placing of fire guards. flat boats, and rafts for the preparation of landing stages. supports and the thickness of the pontoons in the line of the bridge made necessary by this. out with artillery, mortar, and machinegun fire. the river is important since ice causes blocking and the consequent breaking of the bridge. bridge could be executed in the form of a series of light metallic girders or Spengel girders. It is also possible to provide standard suspension bridges for light loads using floating supports. pontoon brigades, were in a serious situation with regard to motor vehicle transport. have manual of transport at the entire disposal of the chief of the engineer troops of the army.